On the weekend of November 11-13, 2011, Wessex Press held another blockbuster Sherlockian conference. 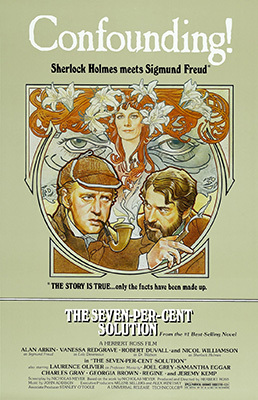 Devoted to Sherlock Holmes on stage, screen, television, and radio, From Gillette to Brett III featured rare Sherlockian films, vendors, and an all-star roster of distinguished speakers, presenters, and events, including the 35th Anniversary Screening of The Seven-Per-Cent Solution, hosted by Nicholas Meyer! The conference was held on the beautiful campus of Indiana University at the Indiana Memorial Union. For a glimpse of what you missed, visit our photo gallery! "Gillette to Brett III Was Unforgettable!" "Wow! What a great weekend!" From Gillette to Brett III. A superb event for Sherlockians everywhere. Without a doubt, one of the most enjoyable events I have ever attended. So friendly, so fun, so edifying. Bravo!"